Its true what they say, ‘it’s not all about winning’….however, it certainly does give you a boost (!) especially when the prize is as baa-rilliant as this one! Have you seen the film yet? If not, Ewe are in for a treat which will send you prancing to the nearest DVD department to get hold of your own copy! It is crammed full of the usual ‘quick fire’ action and unmistakable humourous antics of Wallace, Gromit and Shaun as well as Chicken Run. It’s clever slapstick humour, ‘close shave’ moments and easy to follow storylines make it enjoyable viewing for all ages. This adventure sees the close knit wooly flock set out to the big city to track down and rescue their missing farmer meeting various threats and escaping ‘choppy’ challenges along the way! 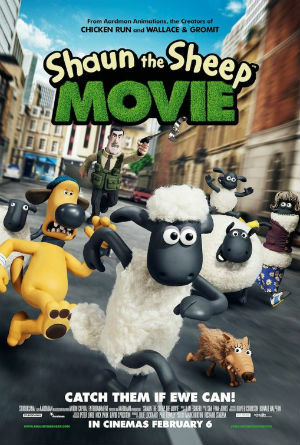 Catchy tunes, brilliant animations and clever plot lines certainly meant I wasn’t disappointed (being a self confessed Shaun the Sheep fan (with time for Timmy too!). I’d definitely recommend checking it out – and the dvd extra’s too for an insider look at the inner workings of the gang behind the farmyard flock!